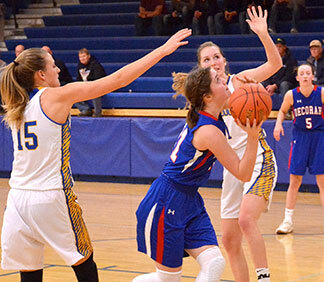 The Decorah girls’ basketball team faced an uphill battle as it squared off against the defending Class 3A state champion Crestwood Cadets on the road Tuesday night. Ranked No. 11, the Cadets strode out to a 48-16 halftime lead. Despite the Vikes having slightly better luck at the hoop in the second half scoring 19 points while holding the Cadets to 12, Decorah fell 60-35. Reining in 11 points for Decorah was Kylah Quandahl. Chipping in seven a piece were Ambria Pipho and Abby Milburn. Nearly two weeks into the season and the Lady Vikes will finally play at home versus Waverly-Shell Rock Friday, Dec. 7, at 7:30 p.m. Decorah will also take part in the third annual Border Battle Saturday, playing Fillmore Central at 3:45 p.m. in the Viking gym. Next week the action begins at Oelwein at Tuesday, Dec. 11, at 7:30 p.m.